Marines to Get Anti-Drone (UAS/UAV) Mobile Laser Weapon System, Soon? : Ground-Based Air Defense Directed Energy on-the-Move (GBADDEM) Coming to a Battlespace Near You…Maybe | DefenseReview.com (DR): An online tactical technology and military defense technology magazine with particular focus on the latest and greatest tactical firearms news (tactical gun news), tactical gear news and tactical shooting news. Looks like the Marines may be getting themselves a new mobile military laser weapon system to shoot those enemy UAS/UAVs (Unmanned Aerial Systems/Unmanned Aerial Vehicles), i.e., drones, out of the sky. Wired Magazine reports that this is at the benevolent behest of the Office of Naval Research (ONR), from whence many good and interesting things come. While the laser weapon system’s name, Ground-Based Air Defense Directed Energy on-the-Move (GBADDEM), perhaps needs a little work (specifically some shortening), it’s frankly about time that someone got on this. In the interest of full disclosure, DefenseReview (DR) is a proponent of infantry and Air Force laser weapons in general. We’re also proponents of anti-missile laser systems to accompany and augment missile defense systems (MDS) like Iron Dome, speifically. At or around the same time we were considering lasers’ anti-missile capabilities and possibilities, it occurred to us that lasers are an excellent solution for dealing with manned enemy aircraft (manned aircraft) and drones. So, we’re totally behind ONR’s effort. 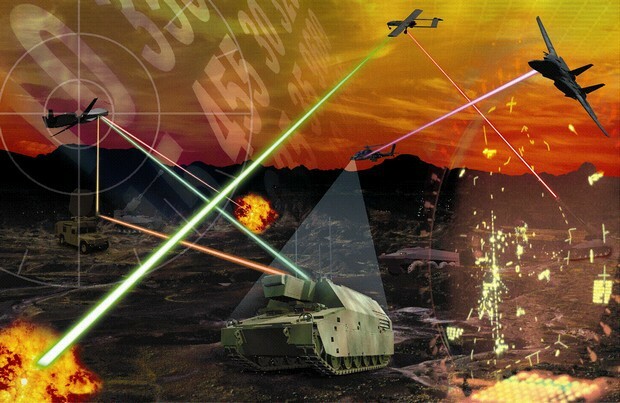 Defense Review assumes multi-spectrum laser weapon systems (including both infrared (IR) and visible laser weapons) will be developed. This isn’t the first article Wired’s done on this subject. Back in October 2012, they published a piece titled Navy Lasers’ First Target: Enemy Drones which covered anti-drone laser systems for ship defense. Then, in March 2013, they published a piece on the Navy’s 2013 laser push titled Navy Will Make 2013 Its Year of the Laser Gun. So, they’ve been on this thing pretty heavy. DR recommends you read the various Wired articles to get the full picture. Rheinmetall 50kW Anti-Aircraft/Mortar/Rocket Laser Weapon System: The Future of Air Defense? SPA Defense/XADS TR3 Laser Rifle for Ship Defense/Anti-Piracy Operations: Hit ‘em with the Big Green Laser Beam! New Military-Grade ADT/Oerlikon Contraves Laser Light Module (LLM 01) Tactical IR Laser Aimer/White Light Module Introduced to U.S. Market by Advance Defense Technologies (ADT): British SAS and German KSK (Special Forces) Ready! Manpackable Laser Weapons on the Way for U.S. Military’s Future Soldiers? Northrop Grumman Maritime Laser Demonstrator (MLD) Shipborne High-Energy Laser (HEL) Tested Successfully: Next Stop, Somali Pirates! Shipborne Raytheon Laser Weapon System (LaWS) Shoots Down Four Drone Aircraft over the Water in U.S. Navy Test (Video! ): Can it Protect our Aircraft Carriers from the Latest Above-Water Threats? Deployable Weapons-Grade Solid-State Tactical Lasers by the end of 2008? Man-Portable PHaSR Laser Weapon Being Developed for U.S. Military Infantry Forces? Stavatti SF-1 Gasdynamic Laser Rifle. Individual Combat Weapon of the Future?